Dukan Diet Menu: What Can I Eat on the Dukan Diet? What Can I Eat on the Dukan Diet? You’ve probably heard of the Dukan Diet. The latest new diet comes from France, and is improving the world of dieting with flavorful food and a diet plan you can actually live with. Doctor Dukan came up with a plan that allows for more than flavorless cardboard processed bars and protein shakes. During Pierre Dukan’s method, you can eat delicious real foods during every phase of the diet. What can you eat on the Dukan Diet? That depends on what phase of the diet you are in. The Dukan Diet is a four-phase approach where you lose pounds fast and don’t gain back the weight you worked so hard to lose. The first phase called the "attack" phase is limited to lean proteins. 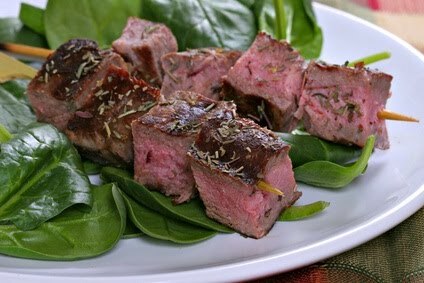 You will only eat lean proteins such as chicken, seafood, lean beef and lean ham as advised by Dr. Dukan. You can use herbs and spices liberally, and use lemon juice for flavor. You cannot have oil, sugar or condiments that contain these items. You can have sweeteners without fructose so you can satisfy a sweet craving during the diet. There are many recipes you can prepare with your long list of lean proteins. Dukan offers plenty of recipes and you can also find great recipes at Pierre Dukan Diet. His new book Dukan Diet Recipes is currently available in the UK. During the cruise phase, a long list of Dukan-friendly vegetables is added and vegetable and protein days are rotated in with the all-protein days. Most of the vegetables that are okay are green, leafy vegetables that are nutrient packed. You can eat these in unlimited quantity on the PV or protein-vegetable days. During the consolidation phase, bread, low-fat butter, fruits, pasta and more are added in, making your diet more well-rounded every day. This is not a time to eat whatever you want whenever you want, Dr. Dukan gives strict instructions as to which foods and how much to eat during this phase. During the stabilization phase, you can eat almost anything - six days out of the week. On the seventh day, you will return to the all-protein diet from the first phase of the diet. You do this forever so you always have one day of protein and restriction to balance the rest of your eating. During your first phase, Dr. Dukan shares tons of tasty recipes to get you thinking creatively about recipes of your own. With loads of choices, like shrimp, lobster, fish, sashimi, chicken, lean ham and lean beef, you have lots of good proteins to base your meals around. Dukan advises using spices generously to make flavorful meals. Try grilled shrimp with fresh herbs, buy fresh fish for sashimi if the budget allows. Try Garlic Lemon Chicken on the grill, hard-boiled eggs or eggs scrambled with basil or chives just to name a few. You can use French mustard (make sure there is no sugar in it!) for added flavor in your attack phase recipes. During the third and fourth stages - you can enjoy bread, fruit, cheese, pasta and other foods you love. The Dukan Diet is specific about how much of these you can eat each day. How many pounds you have lost during the first two phases determines how many days you must stay in the third phase. For those with a sweet tooth, Dr. Dukan also offers some indulgent but approved dessert recipes that you can enjoy on your diet. You can find these Dukan Diet dessert recipes, other vital information and a Dukan Diet shopping list at Dukan Diet Weight Loss.